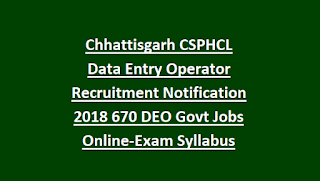 CSPHCL CSPDCL DEO Jobs Recruitment/Exam-2018: CG State Power Holding Company Ltd invites applications for the recruitment available Data Entry Operator DEO jobs in its subsidiary companies of CSPDCL, CSPTCL. There are total 670 DEO jobs in CSPHCL Recruitment 2018. Online mode of applications are accepted for this CSPHCL Data Entry Operator jobs recruitment 2018. Candidates who are qualified degree and having computer programming/Data Entry Operator, Hindi/English typing knowledge, they can apply online before the closing date of 05-11-2018. Official website to apply online for this CSPHCL DEO vacancies is www.cspdcl.co.in. Selection for these Data Entry Operator jobs in CSPHCL will be based on written exam and skill test/ typing test. 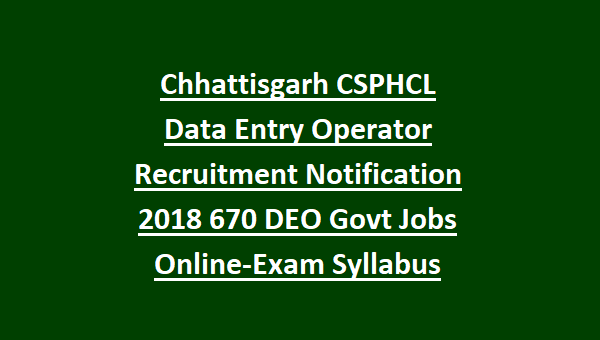 Exam Pattern and Syllabus, Typing test details, age limits, salary, qualifications are mentioned below for this Chhattisgarh CSPHCL Recruitment 2018 of Data Entry Operator Jobs. There are total 670 Data Entry Operator jobs in this Chhattisgarh State Power Holding Company Ltd DEO Data Entry Operator recruitment 2018. As on 01-10-2018 lower age limit is 18 years and upper age limit is 35 years for Genera Male and Female, Gen PWB candidates. And for SC/ST/OBC upper age limit is 40 years. 2nd Class Degree with Computer Diploma Certificate or Any Computers Degree with Typing knowledge on computer with 5000 key depressions. Salary is Rs.19800-62600/- per month for this DEO jobs. Candidates selection for this Data Entry Operator jobs will be held based on written exam and skill test/typing test on computer. Written exam conducted for 200 marks. Total 200 questions and each question carries one mark. 1/4 negative mark for each wrong answer. Based on written exam marks 1:5 ratio candidates are called for Typing test. Typing test will be conducted on computer only. Eligible candidates can apply online for this CSPHCL DEO jobs through official website of www.cspdcl.co.in. Last date to apply online is 05-11-2018.